This was completed in 2003 and the door panel is now displayed in the waiting room of the practice of Dr K.MacLeod and partners in the Medical Centre, East King Street, Helensburgh, on indefinite loan. The door panel commemorates the Helensburgh Hospital (pictured above) which was opened in 1875 and was the first 'proper hospital' Helensburgh had had. At first both general medical and surgical ailments were treated on the ground floor and infectious diseases on the first floor. 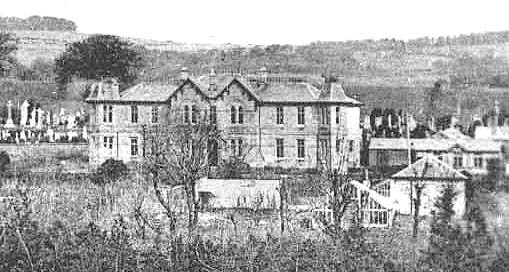 In 1895 with the increasing knowledge of the dangers of cross infections, the general cases were moved to the newly built Victoria Infirmary and the Helensburgh Hospital was re-christened Helensburgh Infectious Diseases Hospital. The Infectious Diseases Hospital was closed in 1956 and it was demolished three years later. The building of Helensburgh's first Hospital was made possible by Miss Ann Alexander of Lomond Cottage, 41 Lomond Street, who left the residue of her estate, £946, for that specific purpose. Her example stimulated others to follow her example and four years after her death the hospital was built.